This is a short story about Jättiläisen Calamity Jane, or Camilla, or Cami, of Mille, or Mill... 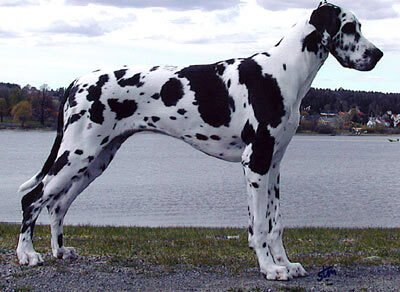 Highly loved Great Dane, with many nick names. 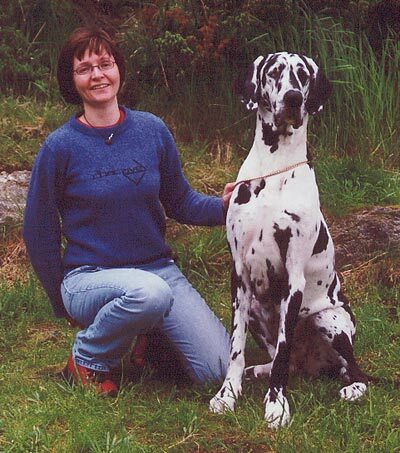 With Camilla a long dream about owning a harlequin came true. 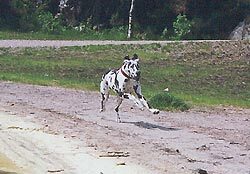 I had never image that I should import a harlequin from Finland to Norway, so this is also the story about the dog from Finland that moved to Bergen in Norway, far from Hyvinkää, and kennel Jättiläisen.What I did not know at that time was that this dog also should bring me many new friends in Finland. I also got a very smart looking female, with excellent temper, and health. Camilla is a very easy dog in all ways, she is for example also a talented obedience dog, witch I should worked a lot more with. But these things are never too late to work with! 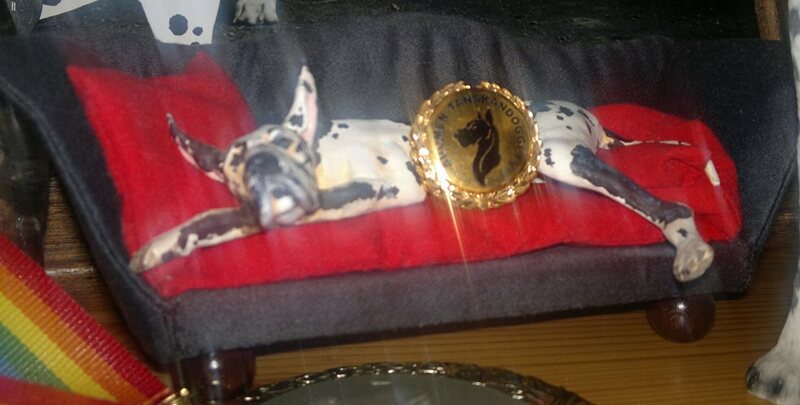 Norwegian Kennel Clubs international show 12/5-2002. Judging: Andrew Thomson, England.Placement: Third best female, CK and CACIB.Critic: Balanced overall, well presented. Balanced head, skull and muzzle in good prop, good reach of neck. Strong topline, deep brisket, stand full square, moved feely with drive. Well angulated stifle. 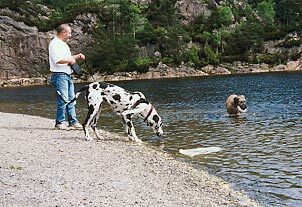 Norwegian Great Dane clubs special show in July-2002, where Camilla became the best female, and second Best in Show. Judging Ron Lewis, England.Placement: Best female, Certification (CC) second BIS. 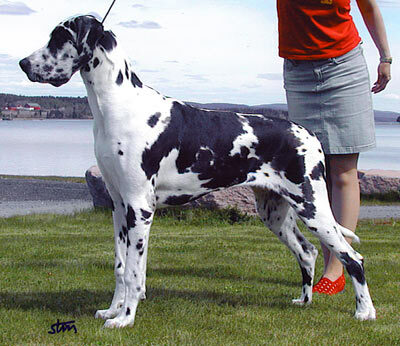 The judge wrote in her critic: Elegant harlequin, 21 months, good head, neck and front, god topline and good rear end & crup, well angulated, moved well. Camilla is the kind of dog that always is happy. 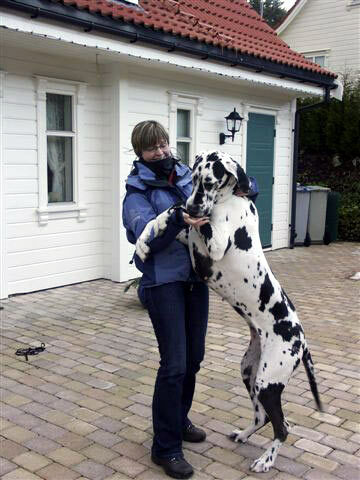 She likes to be close, and sit on the knee.She loves her “Big yellow friend” (That’s our fawn Great Dane, named “Emme”).They play and have lot of fun together! What Cami loves most in the word? I am not sure. 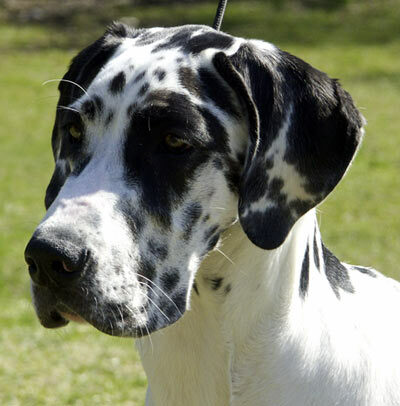 she loves her family, and her friend Emme, she love to play, and run. But I really think Emme is the most important for her. 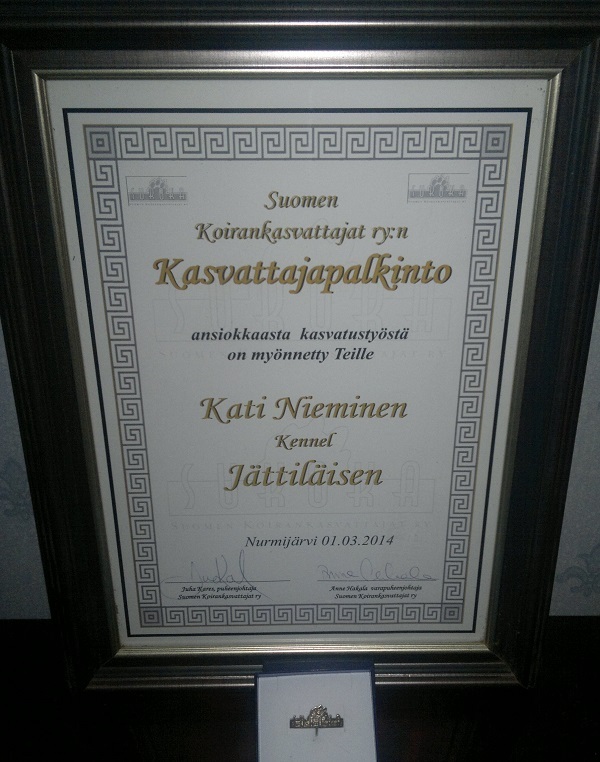 We are all very thankful for all the work kati have done so we could import Cami to Norway. We shall never forget the trust that Kati gave us. 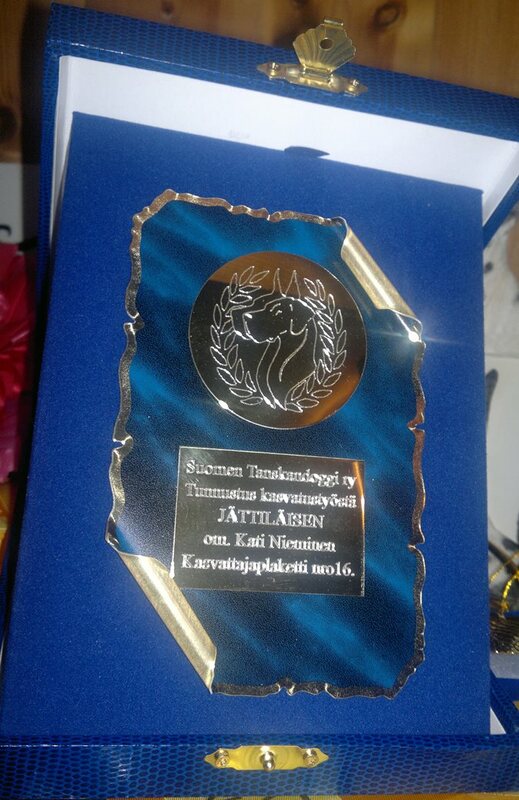 As so many other dogs from kennel Jättiläisen, we hope that Cami also will be an old lady, and stay with us for many, many years!